It's time for some rampant speculation. Disney and Pixar released the first teaser trailer for Cars 3 today, and it looks like a clean break from Cars 2 (which is good news) and even the original Cars. The trailer is 49 seconds long and has one line of text, but that's not going to stop me from picking it apart frame by frame. I have a theory. 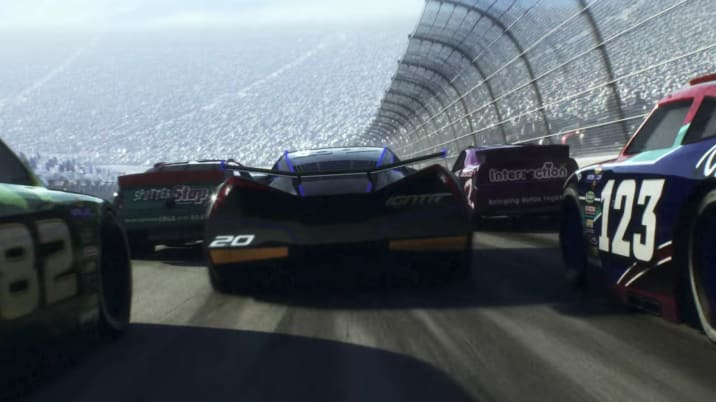 The trailer opens on a gritty shot of a Piston Cup race. Quick clips of the action are interspersed with black screens accompanied by the sound of a heartbeat. It's intense for a kids' movie. But what's this? At 0:16, we see a new kind of car that's emitting the unmistakable whine of an electric motor. Another EV racer appears seconds later, and then we see Lightning McQueen trying to keep it together but breaking apart. Moments later, he hits the wall and goes spinning through the air. This is his own personal Big One. Yeah, it's dark all right. The foreboding on-screen text reads: "From this moment, everything will change." Now we know Lightning isn't going to die. Pixar isn't heartless, and anyway the short plot synopsis it has released confirms that the animated franchise's hero is the center of this storyline (not Mater, thankfully). So here's my theory: McQueen crashes, has whatever qualifies as a near-death experience for an anthropomorphic car, and then gets rebuilt – Six Million Dollar Man-style – with an electric powertrain, maybe even some kind of hybrid. Then he's able to beat those pesky EV newcomers and everything is right in the Cars universe again. Cars 3 will hit movie theaters June 16, 2017. I look forward to being proven right.